his site helpfully fills in some details. Simon Thomsen may have dubbed Zumbo ‘Australia’s most effective croquembouche salesman’ and MasterChef Australia may have made him a household name, but devotees to his Balmain patisserie and café chocolat would probably prefer to keep his creations to themselves. The amazing croquembouche from season 1! So this is how we in TV land know of Zumbo. Like Poh Ling Yeow and Matt Preston, he has been anointed by the MasterChef basting brush of fame. Since becoming a household name, he has clearly been working on his brand. In addition to the series, there’s a book on the way. Although I have never tasted any of his colourful and architecturally stunning creations, I am prepared to believe they must be rather good because of the number of folk who attested to this on episode two of ZUMBO. Although many of these were labelled as fans who had responded to an email invite, the presumably less partisan Sydney TIME OUT and the SYDNEY MORNING HERALD also sing his praises. I am happy to take his prowess with pastry and excellence with an éclair as a given. The show exists because Zumbo has a reputation as a celebrity chef, but if episode two is indicative of this series’ overall quality, I must respectfully disagree with the SBS brass that green-lit ZUMBO. Or more colloquially, WTF is this lightweight piece of self-promotion doing on telly? 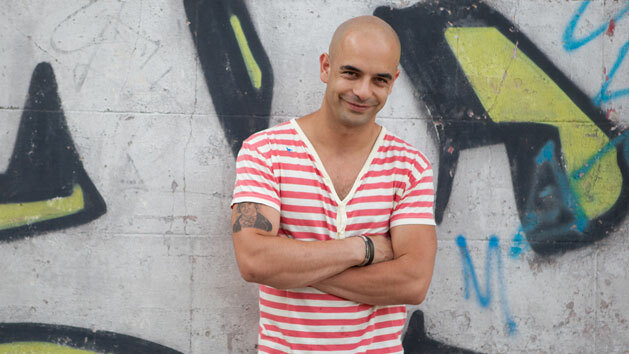 Adriano Zumbo isn’t compelling as chef talent. No Bourdain or Ramsay is he. He’s not even Matt Moran or Maggie Beer. He seems like a nice enough guy on camera, but he is not eccentric, showy or flat out funny. Nor is he particularly instructive about the making of his carefully sculpted pastries. So what makes him worthy of airtime? And SBS’s air time in particular? In episode two (titled SUMMER LOVE) Zumbo had to cater for a fashion show. The pastry was an integral part of the shindig – meaning we got to see models displaying various cakes as they sashayed forth; meaning we got to see ultra thin women fondling more calories in one swift trip down the catwalk than they usually ingest in an entire week. Fun as this was, the best part of the show was witnessing the confusion of Zumbo’s staff as they tried to follow his haphazard instructions and understand his hand-written recipes. However, this was basically fly-on-the-wall stuff, a staple of kitchen reality television. Pia Miranda was the narrator and her voice-over was frothy and overdone. She was emoting and emphasising all over the shop, which made the empty visuals seem even more so. I think Miranda has shown what an excellent actor she can be, so I suspect this was problem of direction. SBS has made some excellent cooking shows in the past. FOOD SAFARI and THE FOOD LOVERS GUIDE managed to inform and entertain. Last night’s ZUMBO did neither. Next week’s episode is more about Zumbo’s family and heritage, so perhaps it will feel more like an actual program and less like a thinly disguised television commercial for some guy’s business.